Little is known of this small publisher of stereoviews from Meadville, Pennsylvania. They were active from the 1890s thru the 1920s. Quite late for a stereoview publisher. It is likely that being based in Meadville, they had some connection with the Keystone View Company. The earliest views known by them were credited to a photographer named T. D. Rust in 1897. In addition to the Yellowstone view shown below, the company also released a series of Yosemite views as well some of Scotland. 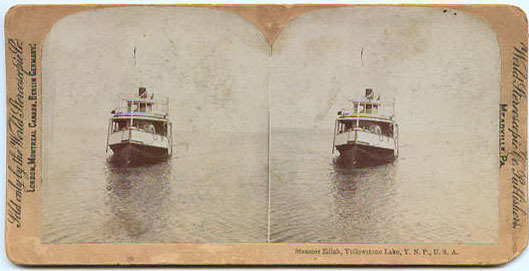 Steamer Zillah, Yellowstone Lake, Y.N.P., U.S.A.
One of only two known Yellowstone views by the World Stereoscopic Company is of E.C. Waters' steamer on Yellowstone Lake.